It was Friday night. 2 weeks ago. In San Antonio. Taylor, Kyla, Katelyn and I had just made the drive down 281 from Austin for a weekend in the Hill Country. 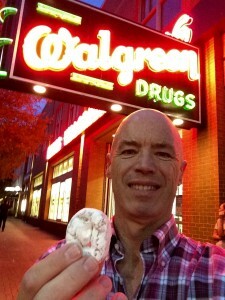 We had settled into our hotel, and I had popped down to the corner Walgreens, along the Riverwalk, to pick up some powdered donuts. The Riverwalk is a special place for our family, both before Maureen’s passing a year ago and since. Actually, I can still remember the first time I visited the Riverwalk with Maureen. It was the Friday after Thanksgiving, the year we had moved to Austin in 1994. She and I sat there basking in the sun, enjoying a beer, thinking to ourselves, wow, it is probably pretty cold back in Chicago, from where we had just moved that summer! The kids and I had come not just to celebrate but to reflect on a very emotional month in our lives. On Friday, October 9, tomorrow, the one year anniversary of Maureen’s passing from this world to the next was still two weeks hence. We knew we needed time then to be ready for now. We knew we needed to come back to the Riverwalk. Like Heraclitus, this river is never the same twice, but the love that flows through it is never changing. It is where we stayed when Maureen and I took the kids to Seaworld. It is the place of Bubbles AND Powdered Donuts. And, on this night, it is the place where heaven once again intersected earth. 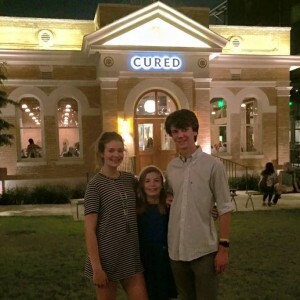 Ever since my visit to Cured back in June, which I wrote about here, I have been raving to the kids about this awesome restaurant in the Pearl Brewery area of the Riverwalk. 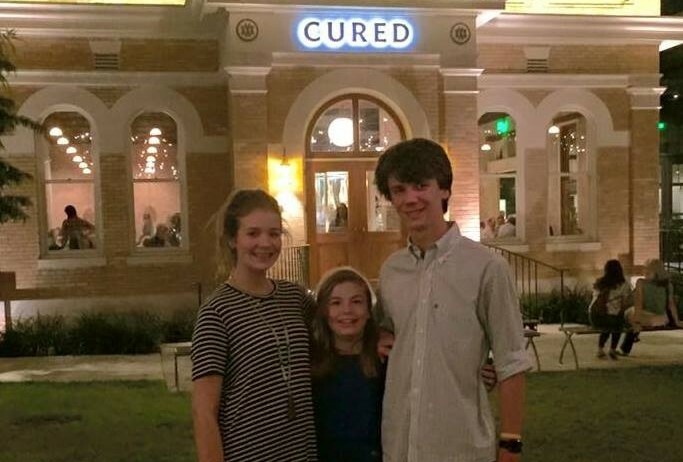 These three kiddos are foodies. They know chefs; they know good food. For almost a decade, Maureen, Taylor, Kyla, Katelyn and I would watch the latest season and episode of Top Chef on Friday nights, eating pizza, laughing at the bleeped out words from the chefs as they crafted ingredients into amazing dishes, rooting for our favorites, dissing those chefs who weren’t playing well or being nice. The kids and I had walked by Cured before, during our trip to San Antonio over the holidays last year, the trip that led to the post on Bubbles AND Powdered Donuts. The kids knew long before I spoke what was happening. Just like one year ago, Maureen was using music to talk with us, to share her love. A year ago, she played Chicago’s Once in a Lifetime through my iTunes library to talk with me alone. This Friday night in San Antonio, she was talking to all 4 of us. The kids couldn’t see what I could see, though. I looked down at the screen of the iPhone of our cab driver. These amazing words were from Lou Rawl’s song, “You’ll Never Find a Love Like Mine.” Before we got out of the cab, I knew I had to share with our driver what had just happened. I knew he would understand because on his dash was a picture of Jesus and the Virgin Mary. The kids told me later that our cab driver had tears in his eyes. I know I had tears in my own. I shared with our driver the story of Maureen, our journey, our reason for heading to Cured, and why this song was so powerful to us. I told him that heaven had intersected his cab on this short journey from our hotel to the restaurant. I then asked him his name, and I was shaken to my core. Abraham he said. Abraham. Abraham is the father of a nation and of a faith. Before God came to him, he was Abram. After God has chosen him, he and his wife, Sarah, who were childless to this point, were parents to a multitude and to a nation. Abraham represents God’s covenant (promise) with us, His people. I know because of God’s covenant with us through Christ that my precious, beloved bride, Maureen is with Him. I also know that heaven is far closer to our daily life than we can even imagine. Maureen and Lou were right. We will never find a love like Maureen’s. We will never find a love like God’s. I can honestly say after a year that I love Maureen even more now than I did the day she passed. Love goes far beyond our physical bodies and the physical world. She and I may not hold hands anymore. She can’t hug the kids like she once did. However, none of that stands in the way of love. 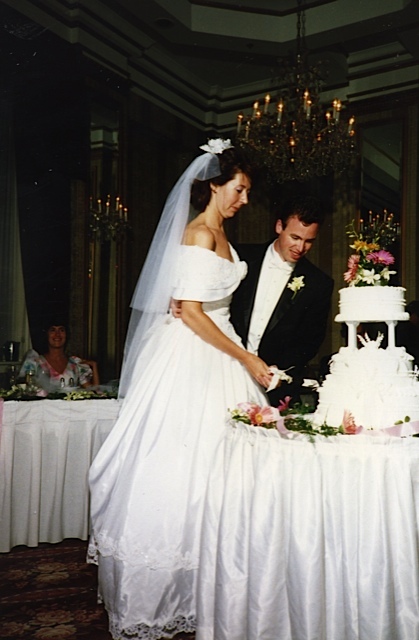 Just over 25 years ago, when Maureen and I stood at the altar of St. Matthew’s Episcopal Church in Evanston, Illinois, we, too, made a covenant. Through the sacrament of marriage, we made a commitment that said quite simply what God has joined together, let no one put asunder. Not even death can stand between us and our love. On that beautiful July afternoon, I was not just lifting the veil to the most beautiful woman in the world. I lifted the veil to heaven. You told me a while back that you were a closeted creative type… And that you worked mostly through others. But I see The Love of Your Life working through you every single day… She is most definitely still the lead architect…She Designs from the heavens as you build on the Earth…..just keep pedalin. ONELOVE.